Week fifty two, the clocks go back GMT this weekend and its finally not summer time anymore, seriously – I’m cold. Light the candles, the fire and why not the heating as well…fluffy pjs, hot chocolate in a favourite mug…I AM READY. Hayley my cohost picked an awesome featured blogger for #thesatsesh this week, click here to see who she went for. Mine is better, seriously even Hayley wanted to pick her. Pen from The Single Swan who often writes about her twinkle of a signet had our readers (well defo me and Hayley) in tears. Her post that I selected is about the metaphorical umbilical cord that follows child birth and never leaves. Pen has a talent for writing about relationships, there is brutal honesty cascading from each word. So, grab yourself a tissue and give it a read. Even if you haven’t got a child – read it anyway, honestly its that good a post. Pen is a writer that never lets me down with great content thats relevant. 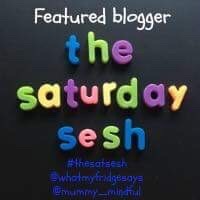 Once you’ve clenched your thirst for wonderful writers, then join us yourself by clicking the blue box at the end of the post and of course refreshing yourself with the rules and regulations of #thesatsesh linky. Thanks for taking the time to join us or rejoin us. We really do appreciate and strive to create a community of variation and quality.